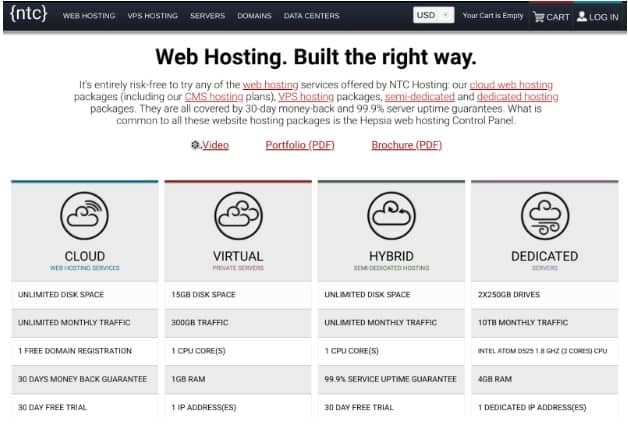 NTC Hosting Review 2019: Is NTC Hosting a Good Hosting? NTC Hosting’s SSD hosting plans are reasonably priced and allow you to choose your data center. They come with a range of easy-to-use tools such as a one-click application installer, a framework installer, and a website builder. In operation for over 17 years, NTC Hosting has years of experience in the provision of web hosting services. This vendor aims to offer customer-centric hosting that is accessible all over the world from data centers located in five countries: the United States, United Kingdom, Australia, Bulgaria, and Finland. NTC’s services include web hosting, VPS, dedicated servers, and semi-dedicated servers. Application Hosting handles hosting for WordPress, Joomla!, and eLearning. It also comes with a one-click applications installer for more than 40 PHP applications including those for e-commerce applications such as PrestaShop. NTC offers a website builder with more than 100 templates and a framework installer that allows you to set up about ten PHP frameworks easily. None of the widely-used control panels (such as cPanel or DirectAdmin) are available with this provider, but it does offer its own easy-to-use custom-made control panel. I like NTC’s backup offerings. Up to four automated backups are taken daily, which is a lot compared with the many web hosts which provide only weekly or monthly backups. And that’s not all, because you can also send a copy of your backups to your DropBox. The only slight issue I have with this hosting company is its 99.9% uptime, which is documented in the SLA but which offers no compensation. The reason it’s a big deal for me is that many customers have complained about frequent downtimes. All of NTC’s shared plans offer unlimited SSD storage; subject to a “fair usage” cap, of course. But coupled with the other resources and features you get – like SSH access, free domain registration, security firewalls, and automated browsable backups – the plans are reasonably priced. There’s a 30-day free trial, which affords you a whole month to try NTC’s services before you buy them. When it comes time to pay, you can do so on a monthly or annual basis, and you needn’t worry about making an annual commitment (after your free trial) because you also get a 30-day money-back guarantee that gives you a refund if it all goes wrong within the first month. NTC’s technical support is available 24/7 via some channels, but telephone and live chat support are limited to business hours. NTC also provides ticket and email support options. When I used live chat during business hours, I was connected immediately to a real agent. This vendor also provides an “Encyclopedia” knowledge base that includes textual explanations and video tutorials. NTC Hosting is a good choice for those looking for shared hosting with a choice of data centers. 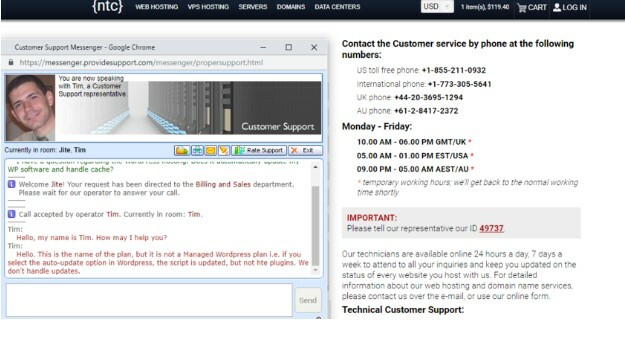 The VPS and dedicated servers are also good options, but be wary of this company’s uptime guarantee. Wondering how NTC Hosting stacks up against other Web Hosting companies? Enter any other Web Hosting company and we will give you a side-by-side comparison.